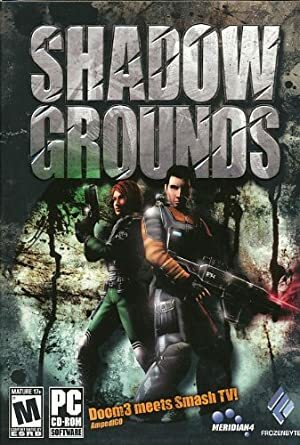 Shadowgrounds is a minor 2006 shooter video game, by Frozenbytes. There are scythe worms in it. For a bit more context, see our Wesley Tyler character profile. 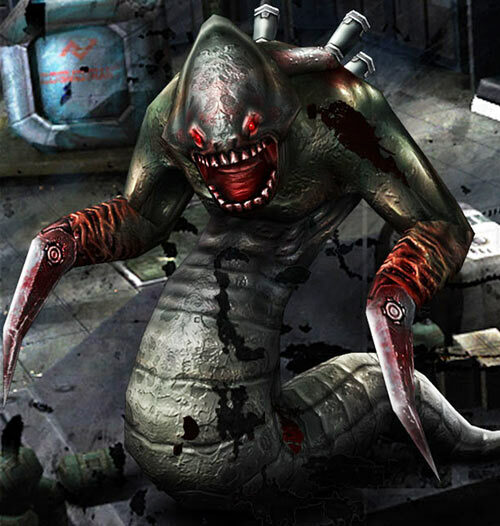 Scythe worms (sometimes spelled scytheworms) are alien warriors. They specialise in ambush tactics and — possibly — reconnaissance. They look like a sort-of-snakish, sort-or-wormish creature with a face and two eyes. They also have a pair of arms, ending in large and wicked blades. Based on other aliens among their army, it seems possible that the scythe arms are artificial implants (possibly inborn) rather than a natural part of their physiology. Scythe worms often emit a distinctive, gravelly hissing noise. This is likely a way to intimidate their prey. Scythe worm can disappear thanks to an invisibility cloak. This too may be a product of technology. However, shining a strong source of light — such as a good flashlight — straight into the field can disrupt it and uncloak the scythe worm. If they cannot be exposed that way, scythe worms are a death sentence for most opponents. 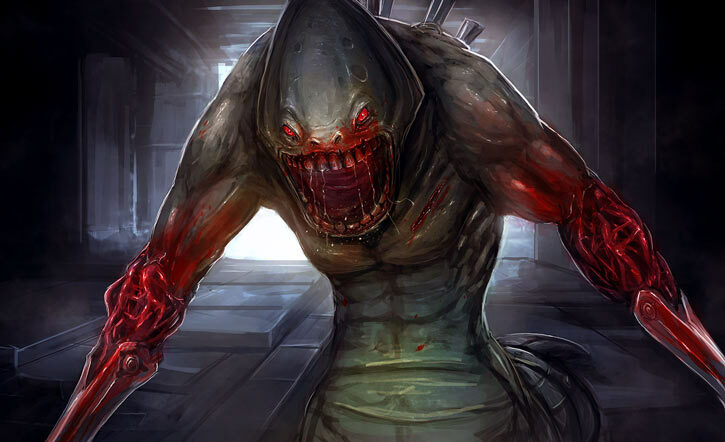 The worms move deceptively fast, their blades are deadly and they have a knack for getting into the back of their foe and shearing them. Charisma (Intimidation) consumes two Actions per Phase, but takes effect over all persons hearing the scythe worm noise. This sound is oddly diffuse – tracking it down with Directional Hearing meets an OV/RV of 07/06. If an entire pod (6+) of scythe worms are using Charisma (Intimidation), it is considered to have 3 APs. CLOAKING FIELD [BODY 02, Invisibility: 05, Limitation: if a light source is shone ‘pon it, the field doesn’t provide complete invisibility. Rather, its APs become the OV/RV for an INT/INT roll to spot the worm, which can be conducted as an Automatic Action rather than a Dice Action if desired. Furthermore, the OV/RV are allowed by one AP for each AP of Flash the light source has (Flash (Steady Illumination Only) fully qualifies for this).]. 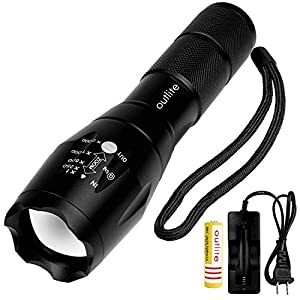 Here I’m assuming that pocket flashlights have 2 APs, a large one has 3, and a military/police-grade one has 4 APs (more for a tactical floodlight).